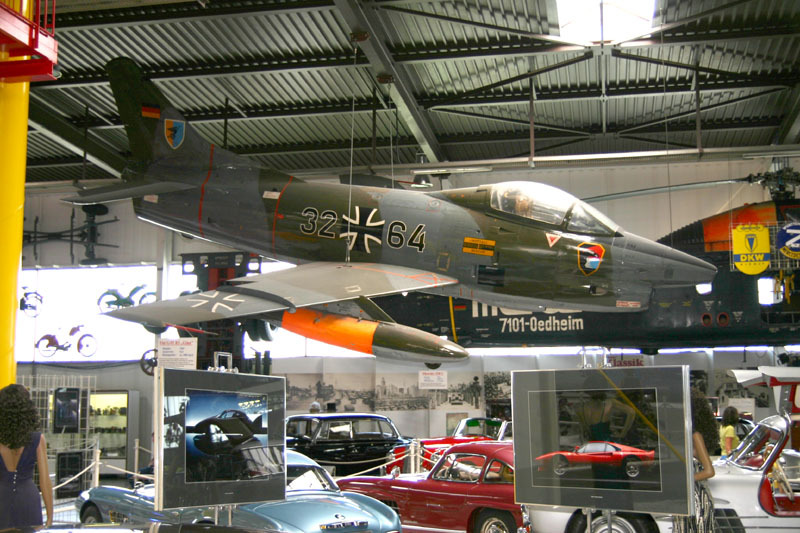 The Auto & Technik Museum in Sinsheim, southern Germany (about an hour south of Frankfurt, exit Sinsheim on Autobahn 6), houses an incredible collection of European aircraft and just about every other type of vehicle. Displayed outdoors and in two huge "Hallen" one will find more than 60 aircraft. 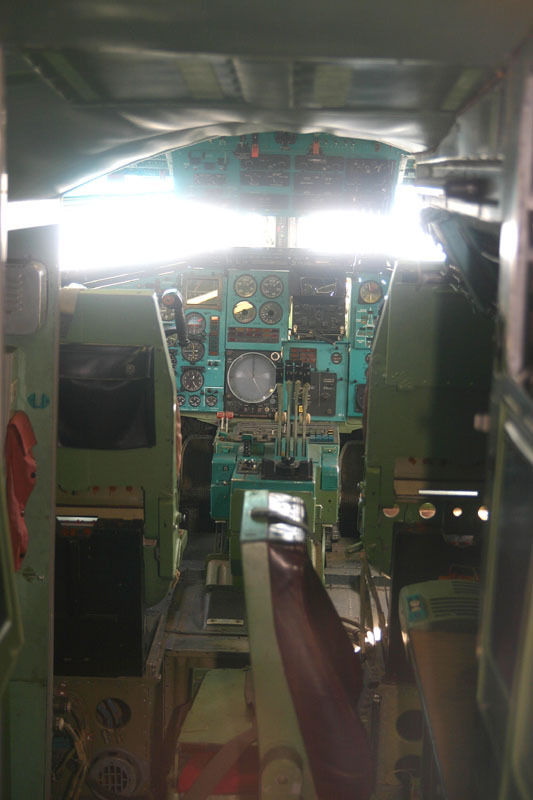 Many if not most aircraft can be viewed inside: ever been aboard a Russian SST? You can here! 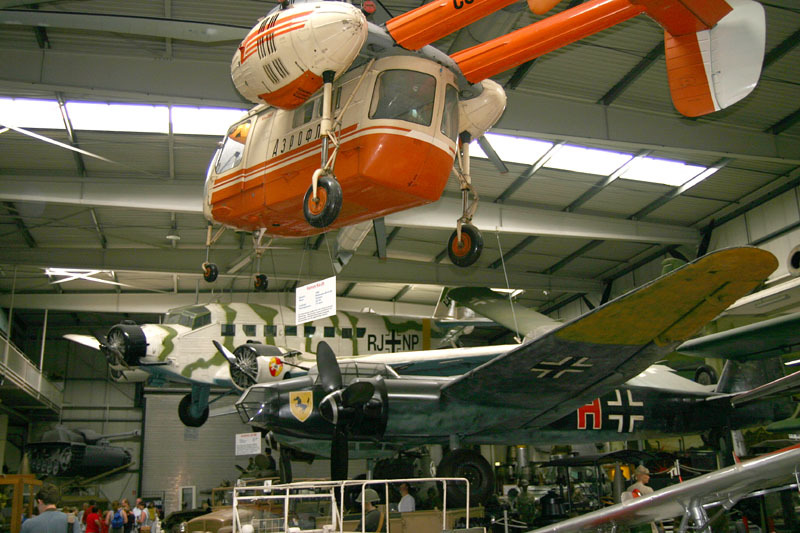 Inside, aircraft are suspended from the ceilings, perched on walls and rest on their gear in improbable locations; the exhibition hall are packed! All around are hundreds of cars-from modern Formula One racers and Le Mans-winning sports cars to American iron and rows of Mercedes (including Heinrich Himmler's personal cars). Hundreds of motorcycles, 22 locomotives and all types of German and American military vehicles complete this impressive collection. There can be hardly a more impressive entrance to a museum possible, than this Aerospatiale-BAC Concorde 101 (F-BVFB, cn207), greeting the visitors "at the door". The move to the museum on 21Jul03. And what is even more impressive: they also have the "Concordski", the Tupolev Tu-144 ! This is CCCP-77112 (cn 07-1). This design was never as successful as the Concorde. 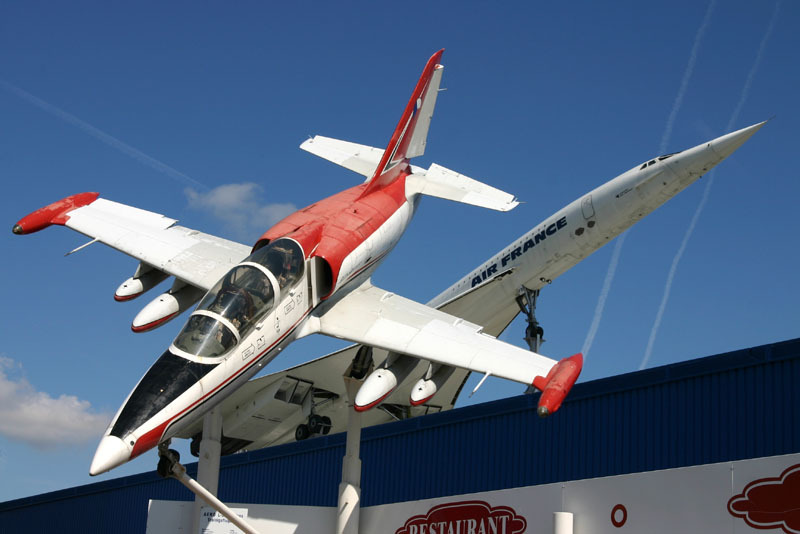 The Soviets proudly displayed a prototype of their new SST at the prestigious Paris Air Show in June 1965. This was the first time the Western press got a good look at the Tupolev Tu-144. 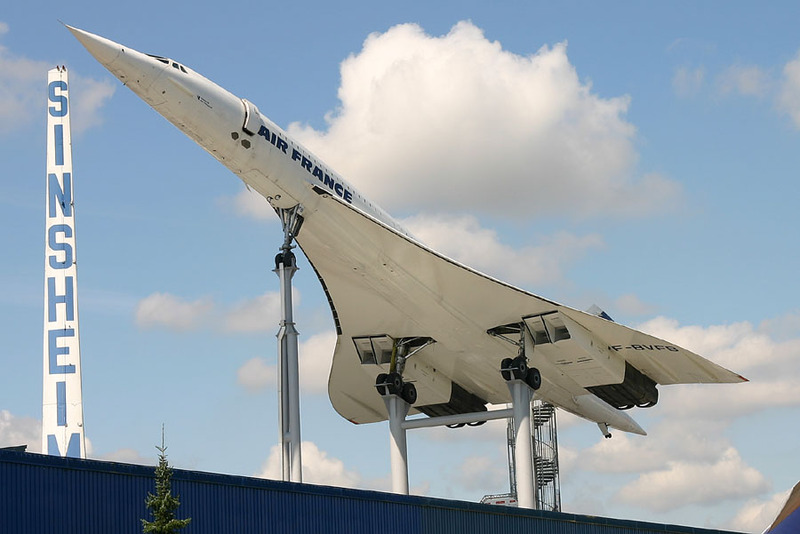 There were of course suspicions of espionage behind the scenes by French and British officials and the press began jokingly calling the new aircraft Concordski (or Koncordski). 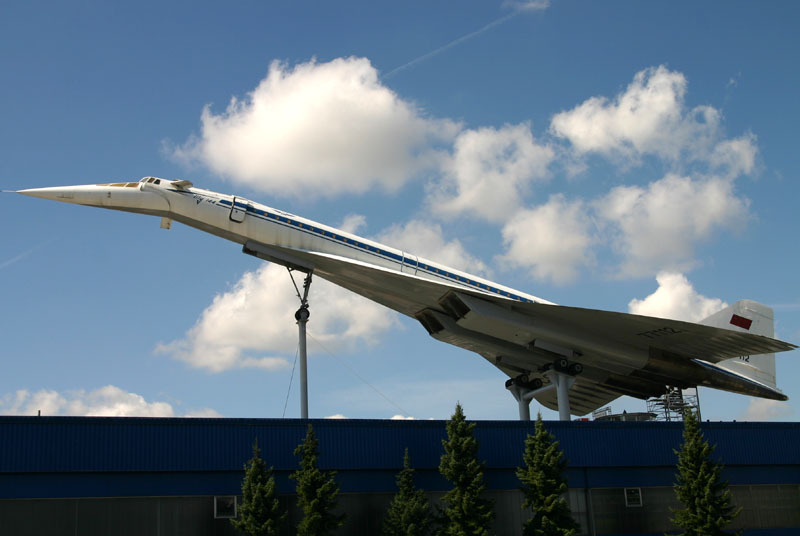 While the Russians got their Supersonic Airliner first in the air, they had taken short-cuts in the design and the Tu-144 proved inferior to the Concorde. 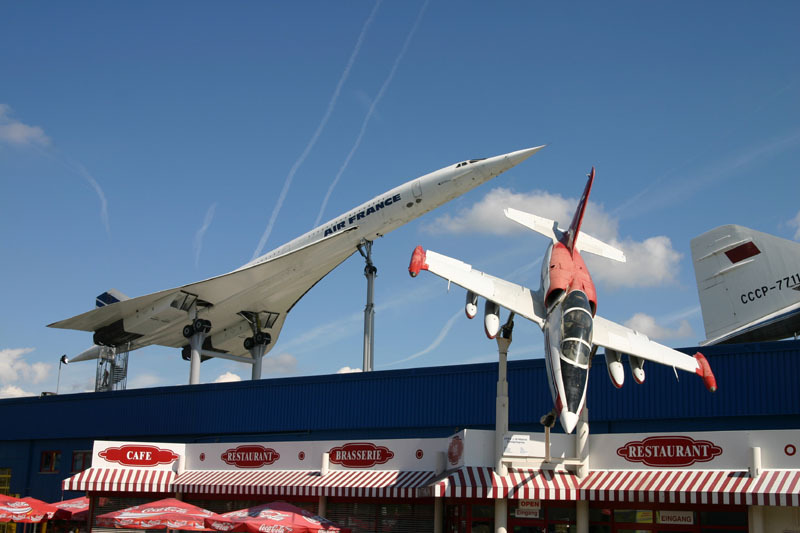 The Concorde and the Tu-144 "met" again at the LeBourget Air Show in 1973; the Concorde, flown by British pilots John Farley and Andy Jones on the 3rd day of the air show, went first and performed impressively. Then it was the Soviets pilot Mikhail Kozlov's turn. 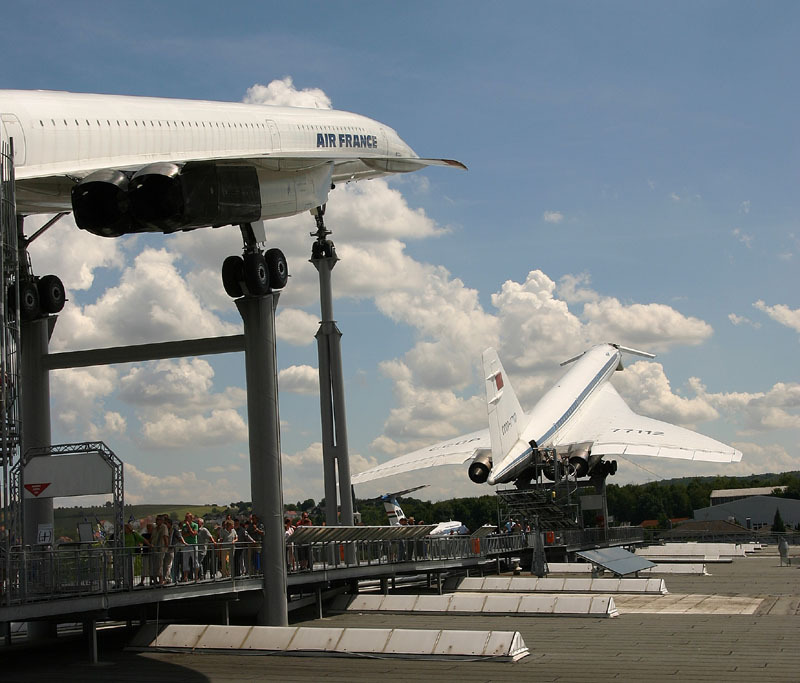 The Tu-144 performed some impressive 360 degree turns over the runway and similar maneuvers to what the Concorde had been seen doing. Kozlov, however, was surprised by a French Mirage right above them, secretly filming them. In an attempt to miss the French aircraft, Kozlov tried a minus 1G maneuver. The Tu-144 engines lost thrust and stalled. The Tu-144 went into a steep dive to regain control and there was only 4.000 feet to do so. When attempting to pull it out of the dive, the aerodynamic forces on the wings broke up the aircraft! All six aboard the Tu-144 were killed, as were eight French citizens on the ground. 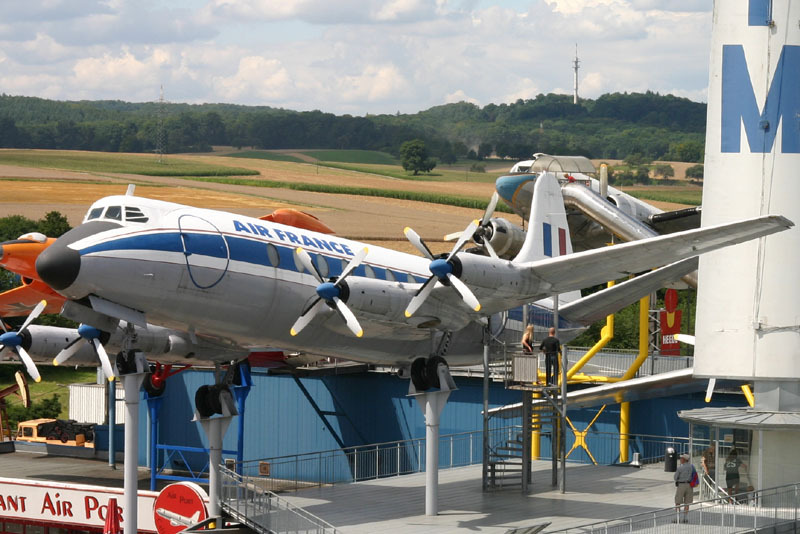 Hunting Percival P-66 Pembroke C54, D-CAKE (cn P66/93) preserved here at Sinsheim. The Pembroke entered RAF service in 1953, in the light transport and communications role. The Pembroke was a military variant of the Percival Prince, modified with a longer wing to carry an increased all-up weight. The prototype flew on 21Nov52 and 45 were produced for the RAF, the last one being completed in Feb58. 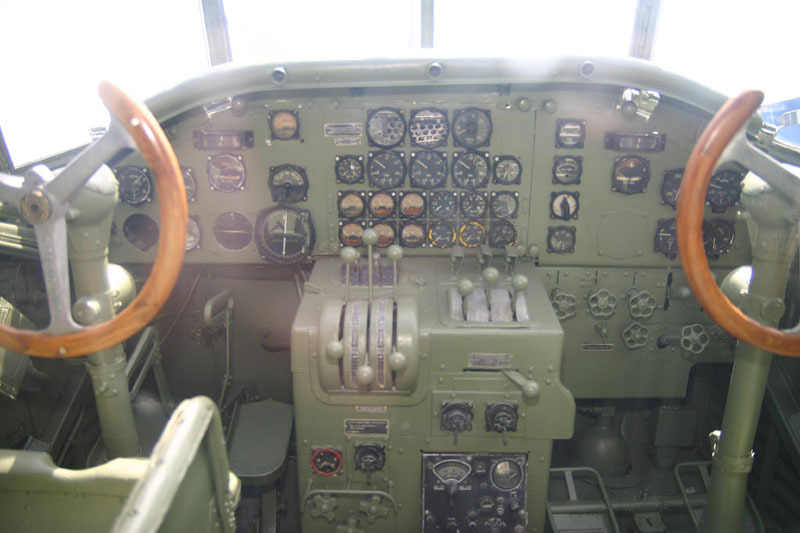 It had rearward facing seats, in common with other RAF transport aircraft. Pembroke’s were modified to extend their fatigue life in 1970. No.60 Squadron was still operating 7 in 1987, but after a total of 35 years service they were withdrawn in 1988. 1. After purchase of the D-CAKE plus 2 other Pembrokes, they were transfered to Mönchengladbach for a general overhaul by Rheinflugzeugbau GmbH and a new painting. D-CAKE then was transfered to Karlsruhe Forchheim. From Karlsruhe Forchheim the aircraft was transfered to Baden-Oos for a complete installation of new airradio equipment (IFR) by Becker Flugfunk Werke and complete new upholstering by a Baden-Oos located company. Then quite a lot of testflights were made, followed for IFR Certification, under the command of Chiefpilot of Rheinflugzeugbau: Capt. Knöpfle. After that period the Aircrew of Flugzeughandelsgesellschaft Karlsruhe was trained (Chiefpilot Kniele). 2. 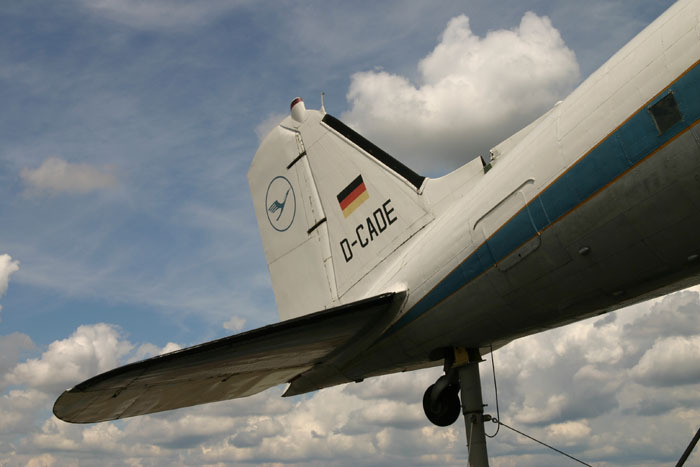 The D-CAKE took part in the 1970 Airshow at Karlsuhe Forcheim with a impressive flight demonstration. The demonstration included both engine's cut off & a forced landing plus several other flight manouvers, under the command of captain Knöpfle. 3. Another interesting change we made to it... The military configuration was 1 Pilot, 1 Copilot, on the bb side pax room an electronic workstation and 6 pax seats: one facing the other with a table in between. We changed this: first we removed the electronic workstation, we then installed behind the Pilot and Copilot seats a seat for one attendant. The capacity in the cabin was changed by having 10 seats in flight direction and 2 seats facing the door. In the cockpit there was a small compartment installed for inflight documentation and for snacks & drinks. In the rear there was a toilet and a luggage compartment. So the total capacity had become 12 passengers & 3 crew. 4. The aircraft (all 3) had been sold sold (aprox. Sept.70) from Flugzeughandels GmbH to Hummel & Wiry and D-CAKE was retransferred to Baden- Oos. 6. Subsequently Hummel and Wiry tried to sell the aircraft. I then lost touch because I undertook several jobs in West Africa and the USA. During a visit I noticed D-CAKE in the frontgarden of the Herzog company. And years later at Sinsheim." Canadair CL-215-1A10 F-ZBBH (c/n 1026) is a recent arrival at Sinsheim. The CL-215 was initially developed to fight forest fires. Canadair produced several preliminary designs in the early 1960s. 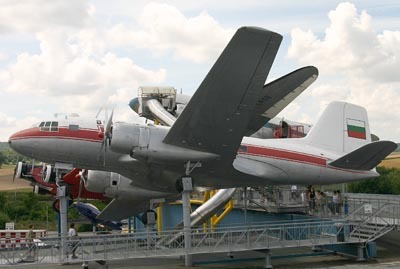 The CL-215 was powered by two P&W R-2800 engines. 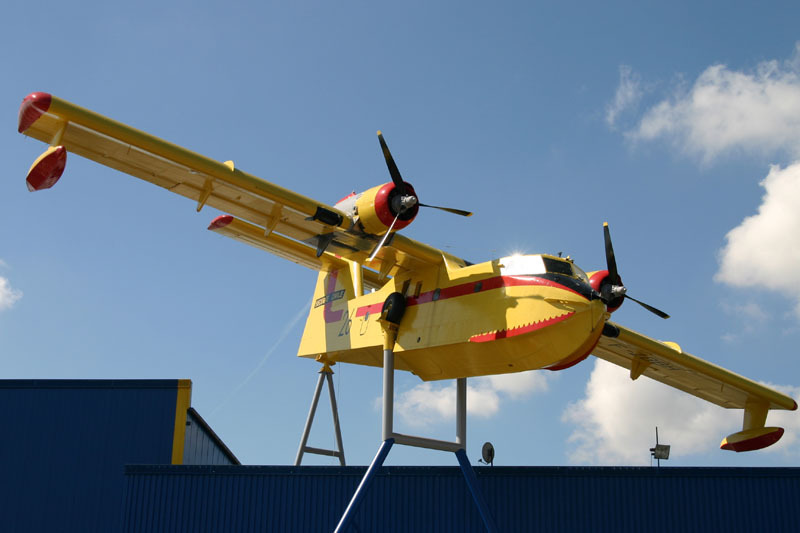 It could fight forest fires continuously for over 4 hours with successive drops of 5,400 litres (1,200 imp. gal.) of water; it scooped the water as it skimmed over the surface of a lake, river or sheltered bay, with a speed of about 130 km/h (80 mph). In Feb66 go ahead was given for a 30-aircraft production program: 20 for the Province of Quebec, 10 for France. The CL-215 made its first flight on 23Oct67. 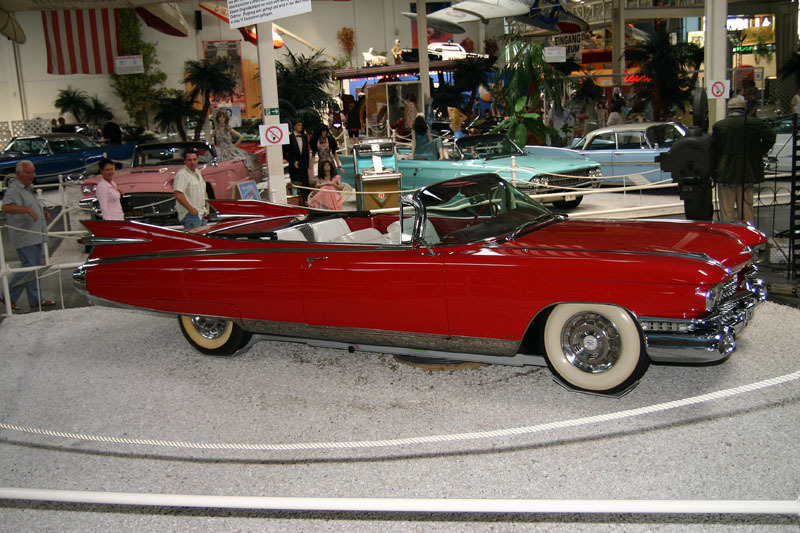 Canadian type approval was granted in Mar69 and deliveries started in June that same year. A newly-elected Quebec government cut the province's order to 15 and the 5 surplus aircraft were bought by France, Spain and Greece. The 30-aircraft program completed and no further orders in the offing, the production line was dismantled and the jigs were stored. But Spain and Greece were very satisfied with their CL-215s after a season or two and they ordered more, for which production was restarted with another series of 20 aircraft. this continued over a period of 23 years ! A total of 125 aircraft were produced. These were supplied to six Canadian Provinces and two Territories, plus France, Spain, Greece, Italy, Yugoslavia, Thailand and Venezuela. CL-215 production ended in 1990. In Nov.2004 the CL-215 fleet status was: Greece 14 - Spain 5 - SOREM(Italy) 4 - Hisporavia(Portugal/Spain) 2 - Thailand 1 - North Carolina 1 - Minnesota 2 - USA Aeroflite 2 - Alberta 7 - Manitoba 7 - Newfoundland 6 - N.W.T. 6 - Quebec 4 - Saskatchewan 6. (total 67, for there are 58 lost or out of service 58). Ilyushin Il-18E OK-PAI (cn 181003105) of Czech Airlines (CSA). The Ilyushin Il-18 enjoyed one of the longest production runs of any turboprop airliner in the world and played a significant role in developing air services in Russia's remote regions in the 1960s and 1970s. The Il-18 was developed in response to a mid 1950s Aeroflot requirement for an economical 75 to 100 seat medium range airliner. The prototype Il-18 (named Moskva) was powered by four 2985kW (4000shp) Kuznetsov SN4 turboprops and flew for the first time on July 4 1957. The first Il-18 entered Aeroflot service on April 20 1959. Initial production Il-18s could seat 75 passengers and were powered by the Kuznetsov engines, but only the first 20 aircraft built were so powered before the 2985kW (4000shp) Ivchenko AI20 became the standard powerplant. 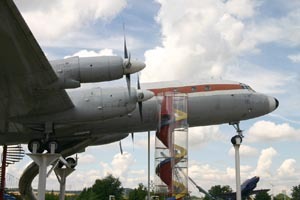 From there on only minor changes characterised the Il-18's development life. The flightcrew of 5 comprising 2 pilots, a flight engineer, a navigator and a radio operator. Initial Il-18s seated 75 passengers, the Il-18B 84, Il-18C 90 to 100, Il-18D and Il-18E 110 or max 122.. It had a max. cruising speed of 675km/h (365kt), economical cruising speed 625km/h (337kt). Range with max payload and reserves was 3700km (1995nm), with max fuel and reserves 6500km (3510nm). Production has been estimated as over 600 aircraft for civilian operators, all initially delivered to airlines in the former Soviet Union, Eastern Europe, China, Cuba and various client states in Africa and Asia. 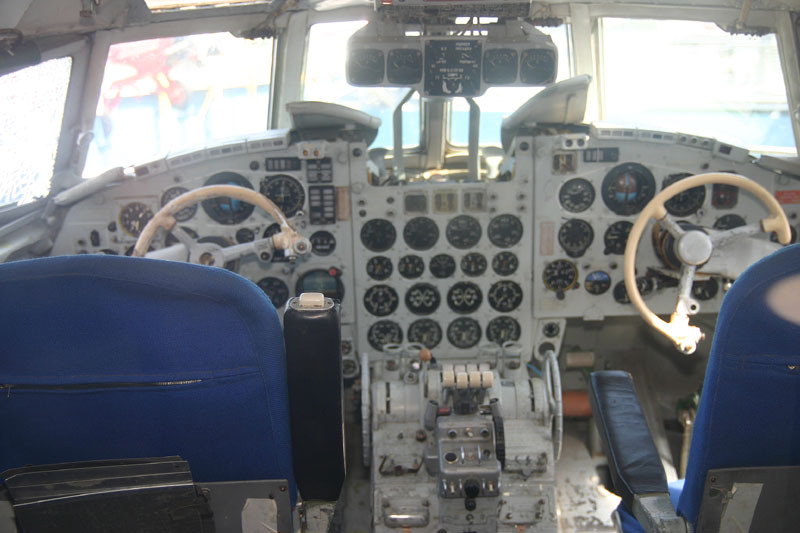 The first new production model was the Il-18B which had a reconfigured interior to seat 84 passengers. The Il-18V entered service in 1961. It became the standard Aeroflot version and could seat 90 to 100 passengers, depending on configuration. The Il-18I introduced more powerful 3170kW (4250ehp) AI20Ms, while seating could be increased to 122 in summer with the deletion of the rear coat closet (essential in Russian winters) and fitting extra seats. The Il-18D is similar to the I but has extra fuel capacity with an additional centre section tank. On the Il-18D and Il-18I the APU is in the belly of the fuselage, rather than in the tail. The Il-18 has the NATO reporting name of `Coot'. Like the Lockheed Electra, the Il-18 also formed the basis of a maritime patrol and anti submarine warfare aircraft, the Il38 `May'. Most Il-18s are now flown by secondary operators on regional routes and on charters as they have been replaced by more modern and efficient jet equipment on primary routes. Vickers 708 Viscount F-BGNU (c/n 38) in Air France colours. 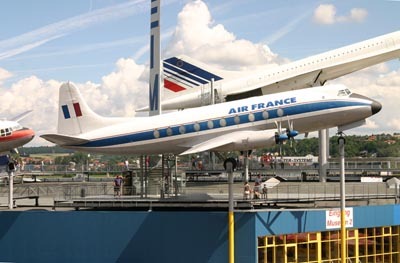 It was first flown and delivered to Air France in 1954. 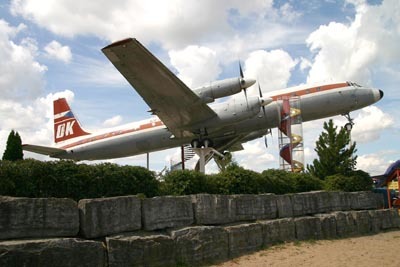 Vicker's Viscount was the first turboprop airliner from any nation to enter service. The Viscount was one of the results of the UK's wartime Brabazon Committee, which was set up to define requirements for British postwar commercial aircraft. By the end of 1945 Vickers had selected the Rolls-Royce Dart turboprop engine that was then under development to power the new aircraft. In Mar46 the British government placed a contract with Vickers to build 2 prototypes of its design (then called Viceroy): 1 powered by Darts, the other by Armstrong Siddeley Mamba turboprops. By the time of the Dart powered prototype's first flight on 16Jul48, Type 630, it could seat 34 passengers. 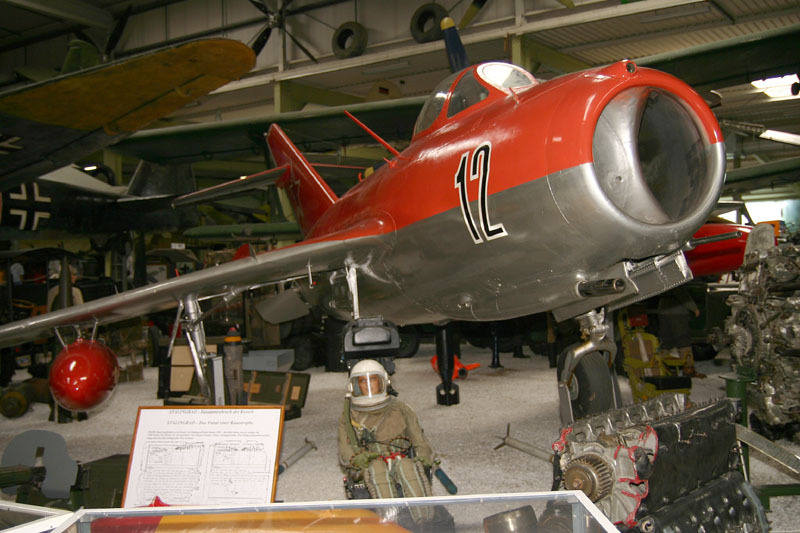 The 2nd prototype, the Type 663, was powered by 2 Rolls-Royce Tay jet engines. More powerful Dart variants enabled Vickers to stretch the design to seat 40. This development was designated the Type 700, and first flew on 19Apr50. Certification was completed on 17Apr53 and it entered service with BEA the following day. The Vickers Viscount became a success due to its good operating economics and pressurisation; it was ordered in large quantities. Its success saw development of the stretched 800 with seating for up to 69, while the final Viscount development was the 810 with more powerful engines and higher weights. First flight 05Jul54 - ordered by Air France in Nov51 and delivered to them on 28Jul54 as F-BGNU. CofA was issued 06Aug54. Subsequently re-configured from 48-seat to a 63-seat passenger configuration. Leased to Vietnam between 06Jan61 nad Jan63. Transferred to Air Inter on 22Jan63, the Certificate of Registration issued on 19Jul63. Withdrawn from use and ferried from Paris (Orly) to Mulhouse-Habsheim on 26Mar75. 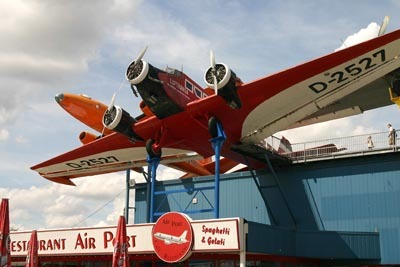 To be used as a clubhouse by the loacl aero club and in Air Inter livery, minus titles. 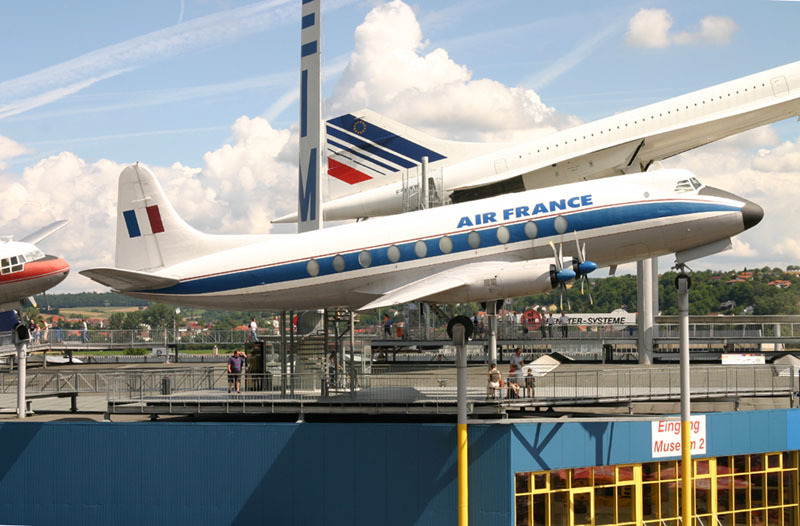 On 28Mar86 dismantled and moved to the Auto & Technik Museum at Sinsheim, still in its original Air Inter scheme but carrying large "Museum Airlines" titles on the fuselage. Still current at the museum in basic old Air Inter colours but now with Air France titles and a French flag on the tail, but no registration. 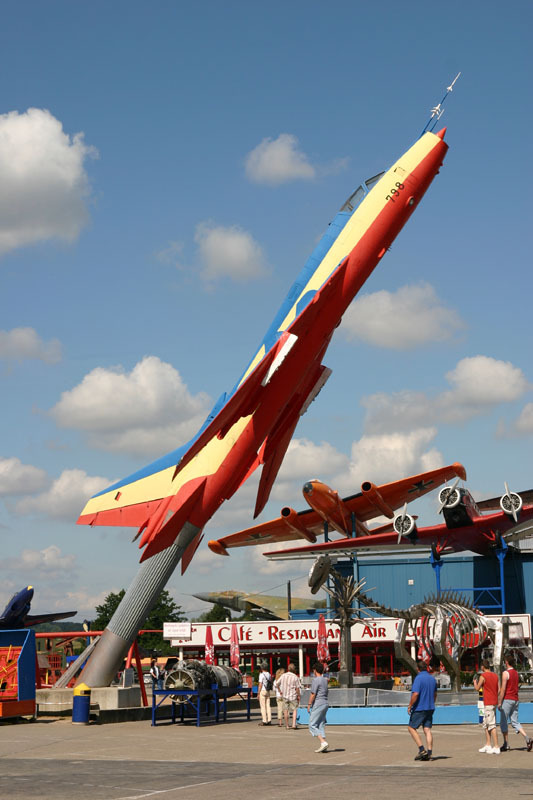 Many aircraft have a slide fitted so kids can have a quick run down; the aircraft being placed on poles like this are for photography less convenient. 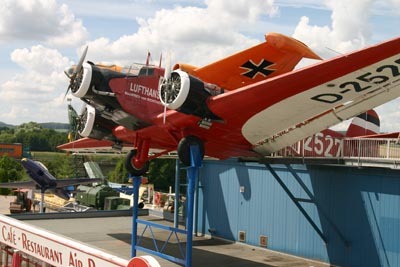 It has been repainted in a red colourscheme and registered D-2527 Manfred von Richthofen, to commemmorate the fact that Herrmann Goering (in charge of the Luftwaffe in WW2) used that original aircraft. This Webpage (Junkers Ju 52/3m/ CASA 352/ Amiot AAC.1) also has it as CASA 352L, c/n 100. The Junkers Ju-52 was the most famous German transport of the WW2. In April 1931, the originally single-engined Ju-52 prototype was fitted with 3 engines. 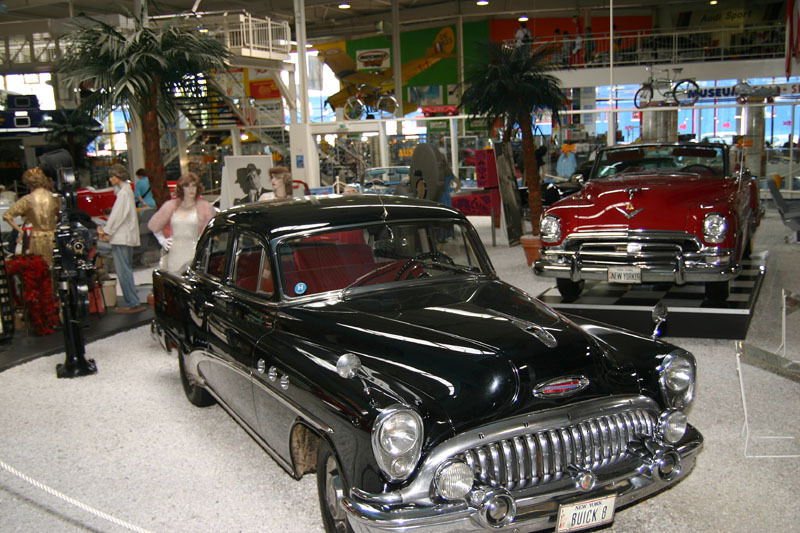 Performance improved tremendously and production of the new model immediately began. The Ju-52 served as an airliner for many nations: e.g. Finland, Spain, Sweden and Germany. It served as a mail carrier in China, and, fitted with floats, hauled lumber in remote places in Canada. Its most commom work, however, was done with the German Lufthansa. 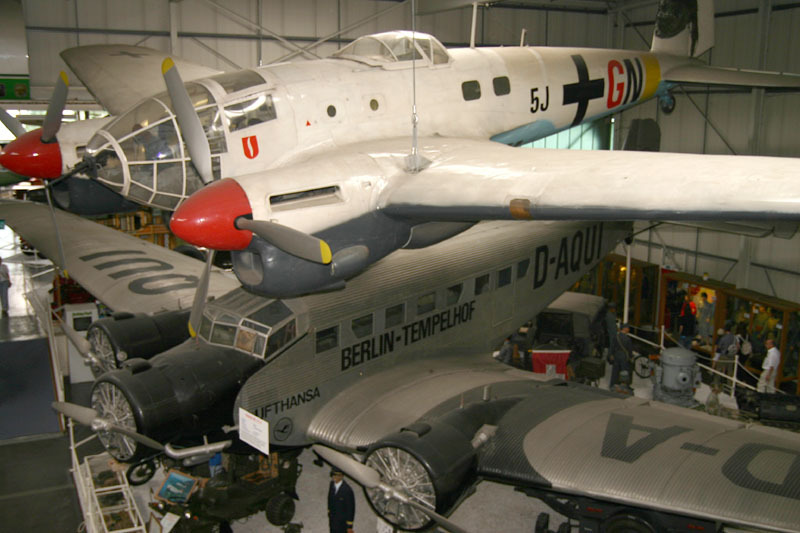 The Ju-52 could fly from Berlin to Rome in 8 hours, over the Alps, an impressive feat in those days! It entered service as a troop transport and bomber with the Luftwaffe and served extensively during the Spanish Civil War and World War II. The Ju-52 was slow and it suffered horrible losses in almost all actions, especially over Crete, the Mediterranean and Stalingrad. The last Ju-52s went out of service with the Swiss Air Force in the late 1980s ­ over 50 years after the first of these durable aircraft first took to the air. Some Ju-52s are preserved in airworthy conditions and flying to this day. The cockpit can be viewed from behind a large glass panel. 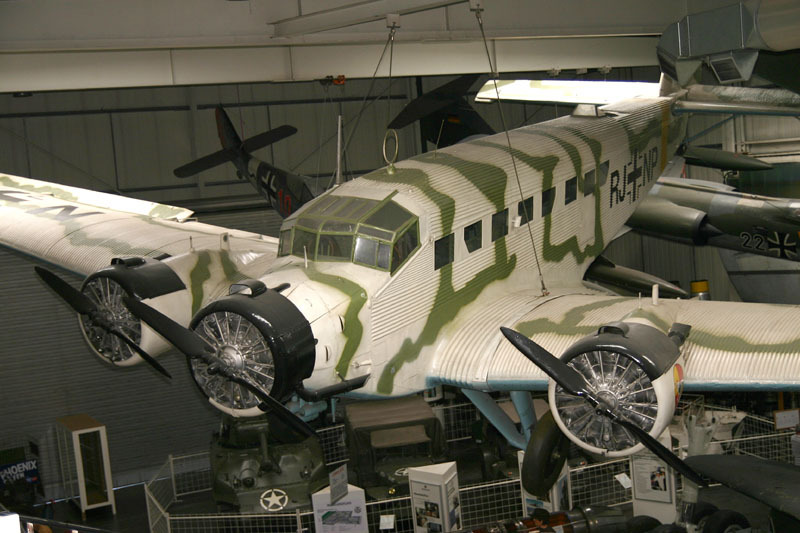 The Ju-52 was nicknamed "Tante Ju" (Auntie Ju) and "Iron Annie" by Axis and Allied troops during WW2. 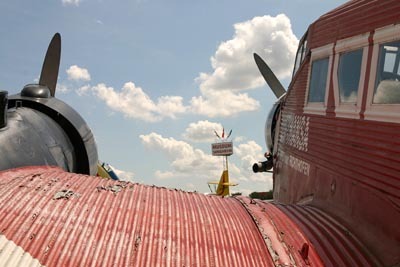 The Ju-52 was built of corrugated metal skin and paid little attention to beauty, features of a typical Junkers design. The corrugated skin, though much stronger than fabric and metal tubes, had a drawback: created stronger air resistance. Up close D-2527 seems to be getting a bit worse for wear. 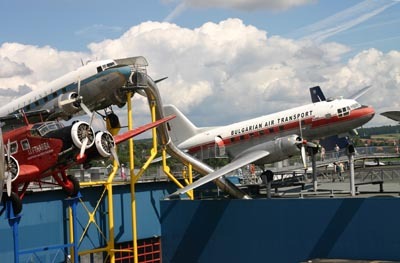 It cannot be easy to do restoration work on these aircraft when they are high up in the air on these poles! Ilyushin Il-14P of Bulgarian Air Transport; it was serial 0833 (c/n 14600833) of the Bulgarian Air Force but this Ilyushin has been preserved in civil colours. The Ilyushin Il-14 was developed as a replacement for the Douglas DC-3 and Russian Li-2 (Soviet licence built development of the DC-3), which were mainly war0surplus aircraft. Ilyushin designed an aircraft with a low wing tricycle undercarriage, powered by 2 Shvetsov radial engines, with maximum seating for 27 passengers. This aircraft was designated the Il-12. The Il-14 is an improved development of the basic Il-12 design. It featured a new wing design with a more efficient aerofoil section, plus more powerful Shvetsov engines. 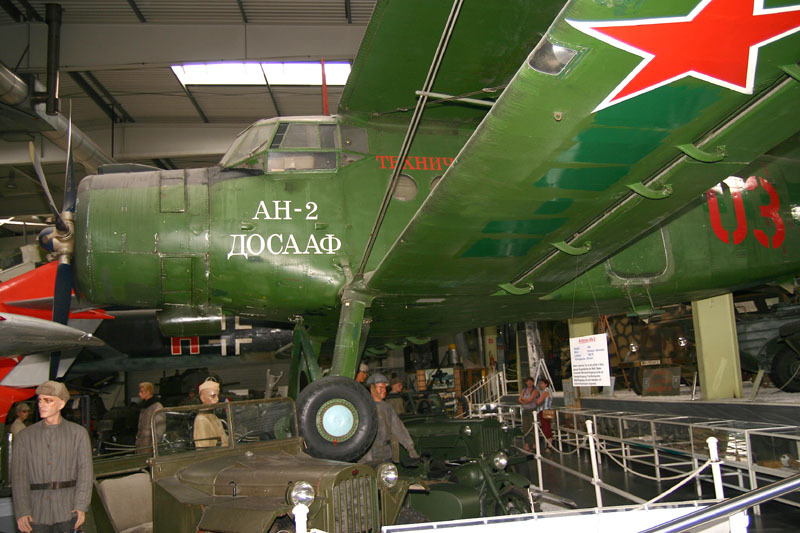 The Il-14 (NATO codename Crate) entered service around 1954 or 1955. Initial service models were designated Il-14P (Passazhirskii or passenger) and they seated 18 passengers. About 2 years after entry into service most Il-14Ps were configured to seat 24 pax in a higher density configuration. 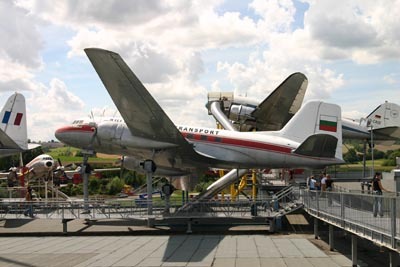 By 1956 a slightly stretched development, the Il-14M (Modifitsirovanny=modified), had appeared. Initially the Il-14M was configured to seat 24 pax, but this was later increased to 36. Many freighter Il-14Ts (Transportny/transport) were built as well, while many airliner Il-14s were later converted to carry cargo. 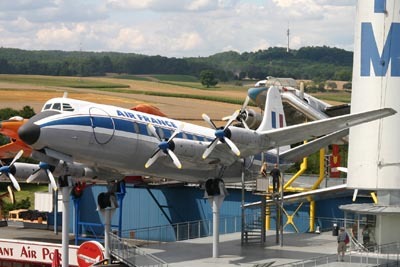 Most Ilyushin Il-14s were built in Russia, at Khodinka and Tashkent, but Il-14s were also built (under licence) in the former Eastern Germany by VEB Flugzeugwerke and the former Czechoslovakia by Avia; 80 VEB Il-14Ps and 203 Avia 14s were built. 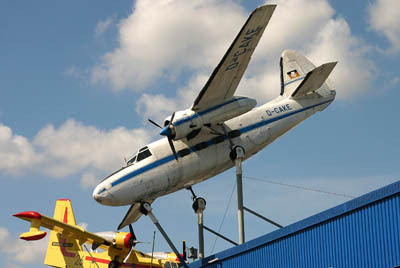 Today few Il-14s remain in service, most are used for general freight and charter work. This Douglas C-47A (c/n 14005/25450) saw life first as 43-48189 upon delivery to the USAAF in 1944, quickly transferred to the RAF as KG773. On 20Mar47 it was registered to Scottish Aviation moving on to Hornton Airways with G-AKLL as tailnumber, registered 18Nov47. It moved to Spain and was registered EC-AEU for Iberia on 10Jun50. In 1966, over 20 years old!, it was enlisted with the Spanish Air Force as T3-62 and operated with a variety of codes: 901-12, 911-12, 744-62 and 911-11. 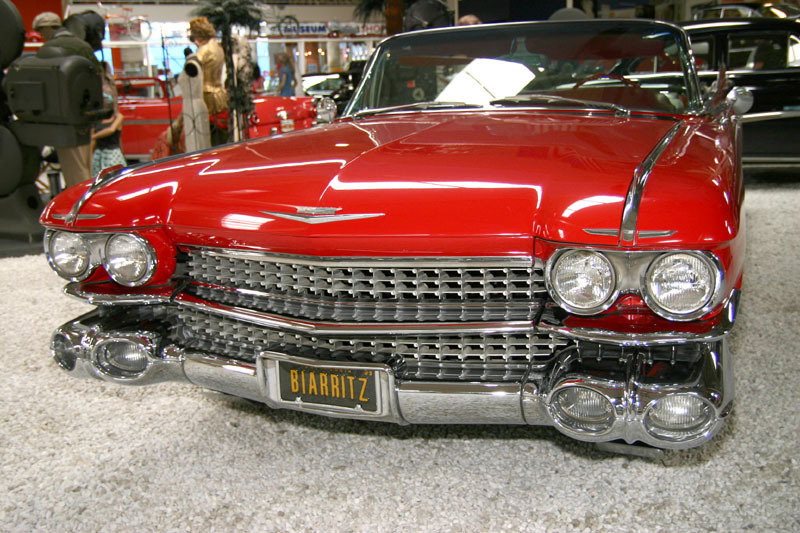 It was withdrawn from service Oct77 at Cuatro Vientos AB. Source: Douglas DC-3 and its predecessors by J.M.Gradidge (Air-Britain, 1984). In July 1979 the C-47A was registered N8041A and on 27Aug79 the name of the owner was registered: R Korastinsky of Munich, Germany. It appeared on display at Stuttgart in May80 as "D-CORA", obviously as fake as "D-CADE"! It looks like a Lufthansa Ju-52, but is in fact a Spanish CASA 352L, formerly with the Spanish AF as T.2B-209. Identical to the famous Heinkel He-111, this is infact a Spanish-built CASA 2111B, formerly with the Spanish Air Force as B.21-82. Antonov An-2T HA-ANB (c/n 16805) as "03" (red) in Soviet Air Force colourscheme. The versatile An-2 (NATO codenamed Colt) has been used as a paratroop transport, glider tug, navigation trainer, utility transport and light bomber. The An-2 prototype was first flown on 31Aug47. 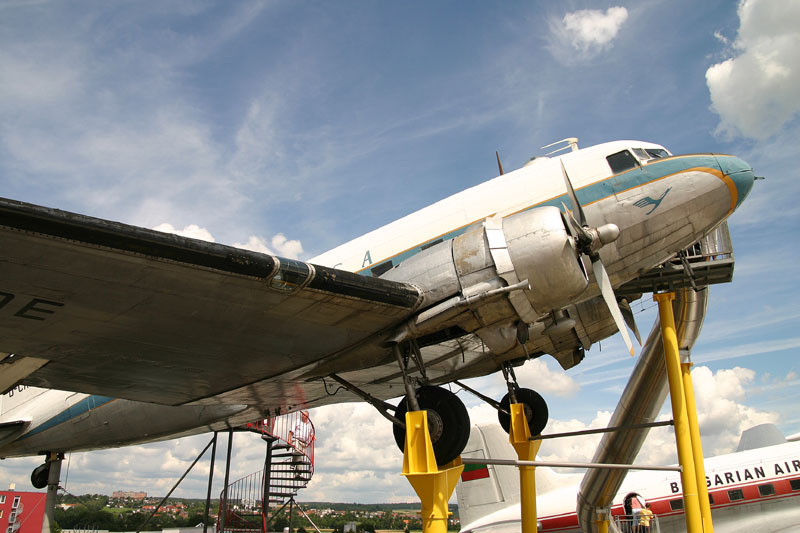 The designer, Oleg Antonov, had been an aircraft designer during the WW2. He then formed his own bureau with the intention of creating an aircraft capable of almost any task. He succeeded. 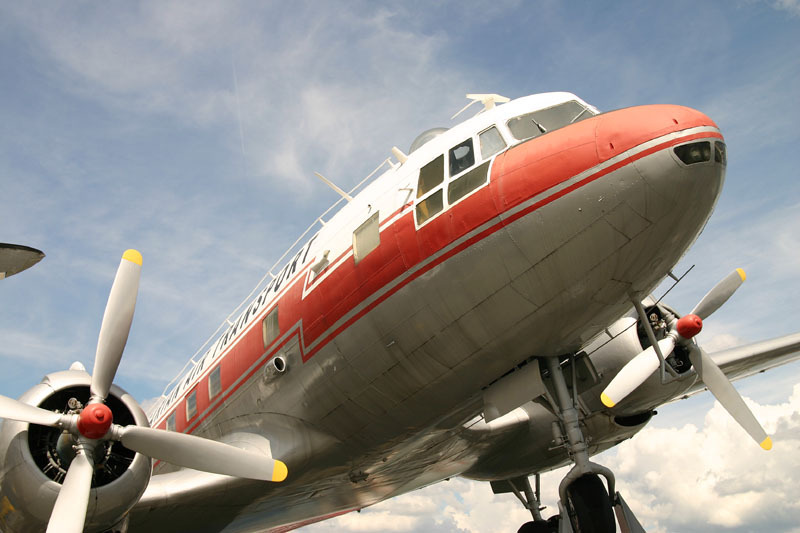 Originally designed for the Ministry of Agriculture and Forestry in the former Soviet Union, the aircraft was soon adopted by the Soviet Air Force and built for its client states. It is ideally suited to less developed countries because it requires little maintenance and is easy to fly. It has extremely short take-off and landing (STOL) capabilities. This is partly achieved not only by the high-lift double wings, but by the use of the drooping ailerons which can be lowered 20 degrees to compliment the flaps. The wings are covered in fabric aft of the front spar and the tailplane is also covered with fabric, making field repairs easy. It has a crew of two. 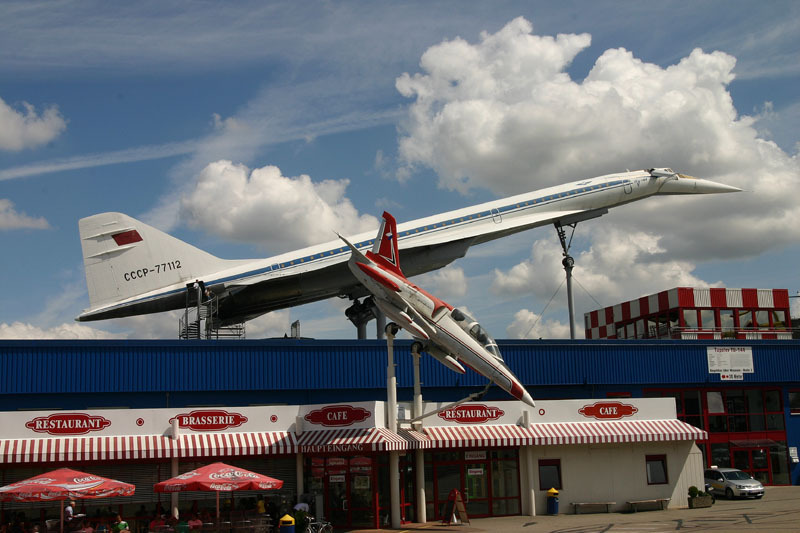 More than 12,000 Colts have been produced at the PZL Mielec plant in Poland since it signed a licensing deal in 1960. The Antonov plant in Kiev produced 5,000 before it stopped production in 1965. The design was also licensed to China, where 1,500 were completed as the Harbin Y-5 transport airplane between 1957 and 1970, and more were produced as the Fongshu 2. Dr. Péter Moys sent me an early photo of HA-ANB, Budapest 1961. Junkers Ju-87B. 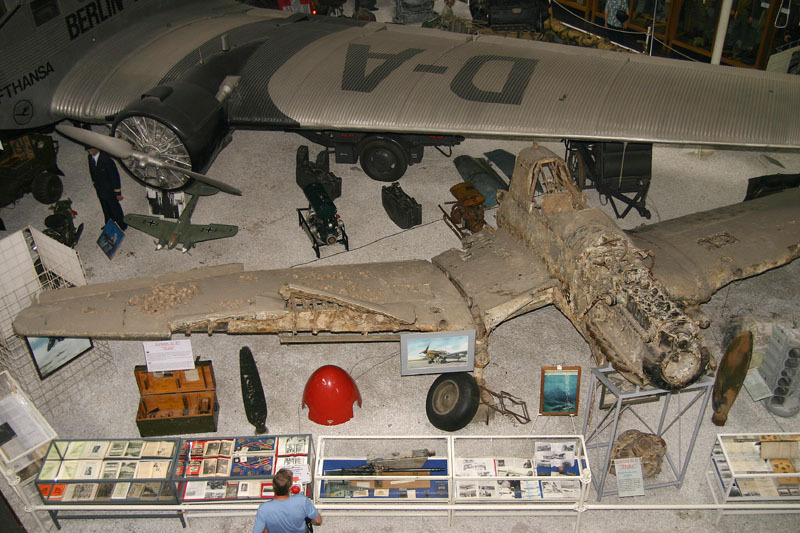 This rare Ju-87 Stuka was rescued from the sea bed of the bay near St. Tropez in France. It was rescued from a depth of 60 metres, where it sank after being shot down on 16 Aug 1944, while attacking the Allied invasion fleet. It belonged to the 4.StG77. The tail unit is missing and still rests at a depth of 100 meters in the Mediterranean Sea. Source: www.airliners.net by TZ Aviation. The above information quoted cn 1301643, but this seems to be in doubt. World wide there are only very few of these Stukas (Stuka means Sturzkampfbomber, meaning dive bomber) who survived their WW2 career. The wreck was located 1982 , 60m deep in the mediterranean near the Cap St. Tropez. During 1989 it was partially raised as the tail was left there in 100 m deep water, unable to get to it. 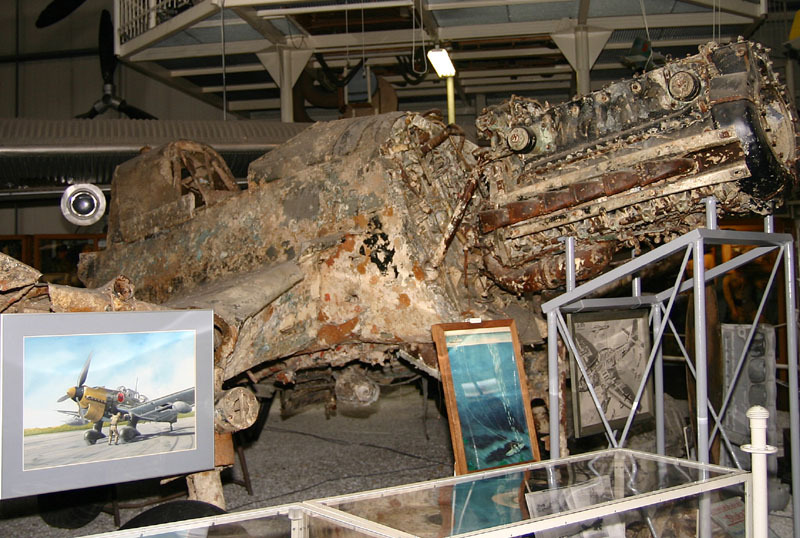 The plane was lost during an attack against american supply ships on 16Aug44. Originally it belonged to the 4/StG 77 (eastern front) and was transfered due to it's old technical design, to a training unit at an Ergaenzungsstaffel in Freijus (France). 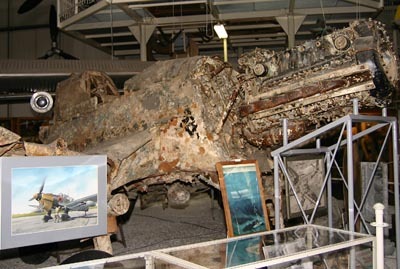 The cockpit canopy was shoved backwards when the plane was found: perhaps the crew had managed to bail out. It seems restorations are on hold. 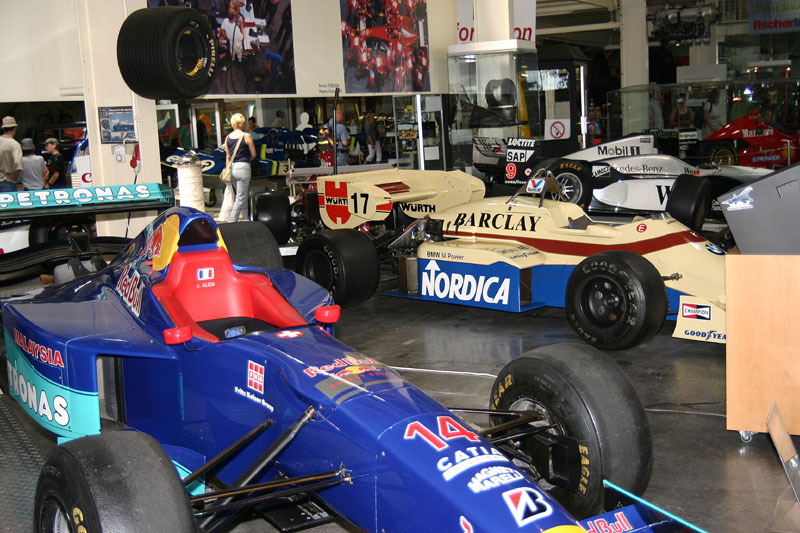 There are two large halls where an impressive collection of cars and also aircraft can be seen.